Walking your daughter down the aisle is probably something that you have looked forward to since she was a little girl. Therefore, when the day finally comes, you are probably ready to give up all that you have to ensure that you look your best on this big day. However, some simple mistakes that you could make when purchasing the shoes for the big day could make the whole day a disaster for you. Here are three mistakes that you need to avoid when buying shoes as the mother of the bride. More often than not, when buying anything that you intend to wear on a wedding day, beauty comes first, and everything else follows. However, this should not be the case when it comes to selecting the shoe that you intend to have on that day. Remember as the mother of the bride; there are several responsibilities that you will be expected to handle which may require you to keep on moving from one place to another. For this reason, you need to ensure that the shoe you have is not only good looking but also comfortable to spend the day in. 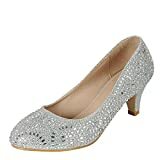 In case you are not used to wearing heels, avoids having them on your daughter’s wedding as this could embarrass you at some point. Try having a pair of comfortable flat shoes that will keep you comfortable and happy for the rest of the day. If you have to wear a heel, consider making it short. After all, it will be embarrassing for you to trip as you walk your daughter down the aisle. Ideally, it is assumed that everything that’s to be worn on the wedding day remains new and packaged and not tried on before the wedding day. However, not breaking in your shoes before the wedding day could cause more harm than good. In case you decide that the shoes will remain in the box and you get to use them only a few minutes before walking your daughter down the aisle, they may end up surprising you. 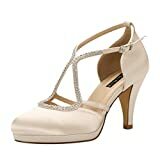 For this reason, after purchasing the shoes a few weeks before the wedding day, try putting them on around the house or in the office for them to get used to your legs. This will also help you determine whether the shoe is comfortable enough to be used on the wedding day. However, take care not to damage the shoes or make them dirty. This will make you not be at your best when it is time to show off. As much as the gown is usually a big center of attraction on the wedding day, the Mother of the Groom dresses that you will use will also have a big impact. Additionally, to ensure that the dress will look its best, it is important to complement the look with something more such as the shoes or jewelry that you will wear. To ensure that you have a perfect look, it is advisable to pick the shoes before going for the dress. This will help guide you on the length and design of the dress that you should go for. You could also decide to have the shoes, and the dress has the same color or different colors that complement each other. The day that you walk your daughter down the aisle is as important to you as it is to her. For this reason, it is expected that you will look perfect on this day. 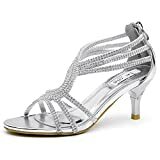 Use the tips above to see some of the mistakes that you need to avoid to ensure that you have the perfect shoes as well as the best Mother of the Bride Dresses on your daughter’s wedding day.